Interrupt · Jeff Carlson · ex 47North 2013; ebook-exclusive; expanded from the short story of the same name (Strange Horizons,January 2003). The Master Conjurer · Charlie Jane Anders · ss; given as Small Dead Creatures in the Table of Contents. Augusta Prima · Karin Tidbeck · ss Weird Tales Spr 2011; translated from the Swedish (Augusta Prima, 2009). Holy Places [Ile-Rien] · Martha Wells · na Black Gate Sum 2007; ebook exclusive. 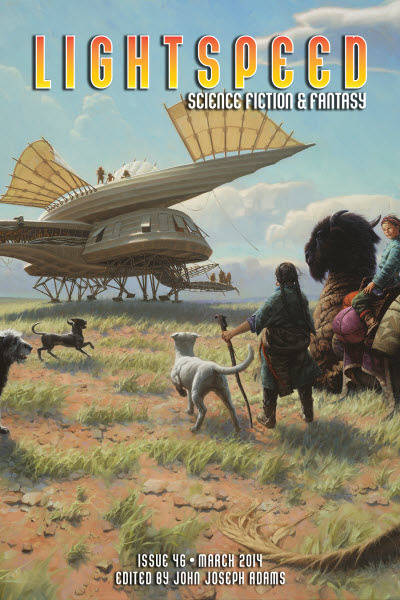 Ancillary Justice · Ann Leckie · ex Orbit 2013; ebook exclusive. Starhawk [Priscilla Hutch Hutchins] · Jack McDevitt · ex Ace 2013; ebook exclusive. SEAL Team 13 · Evan Currie · ex 47North 2013; ebook exclusive. Invisible Planets · Hao Jingfang; translated by Ken Liu · ss; translated from the Chinese (New Realms of Fantasy and Science Fiction, 2010). The Ballad of Bowsprit Bears Stead · Damien Broderick · nv Edges, ed. Ursula K. Le Guin & Virginia Kidd, Pocket 1980; ebook exclusive. Twinmaker [Twinmaker] · Sean Williams · ex Balzer + Bray 2013; ebook exclusive. 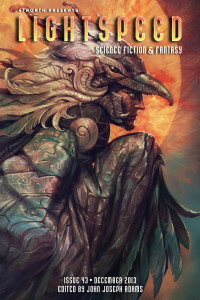 The Chambered Fruit · M. Rickert · nv The Magazine of Fantasy and Science Fiction Aug 2003; ebook exclusive. The Cormorant · Chuck Wendig · ex Angry Robot 2013; ebook exclusive. A Darkling Sea · James L. Cambias · ex Tor 2014; ebook exclusive. 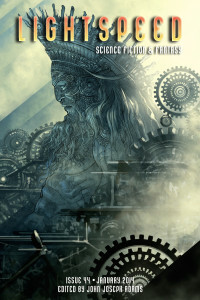 Clockwork Heart · Dru Pagliassotti · ex EDGE Science Fiction and Fantasy 2013; ebook exclusive. Video Games · Anon. · ar; ebook exclusive. Hellhound · Robin McKinley · na Fire: Tales of Elemental Spirits, Putnam 2009; ebook exclusive. Annihilation · Jeff VanderMeer · ex Farrar, Straus & Giroux 2014; ebook exclusive. Dreamwalker · C. S. Friedman · ex DAW 2014; ebook exclusive. 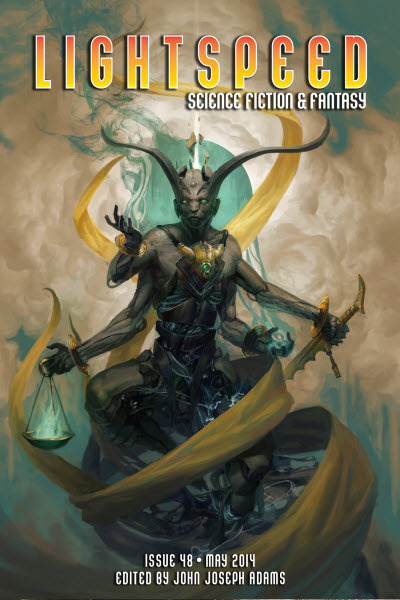 The Trillionist · Sagan Jeffries · ex EDGE Science Fiction and Fantasy 2013; ebook exclusive. Panel: YouTube for Geeks · David Barr Kirtley, John Joseph Adams, Matt London & Cate Matthews · ar; first appeared on Wired.comÆs The Geeks Guide to the Galaxy podcast. The Lucky Strike · Kim Stanley Robinson · nv Universe 14, ed. Terry Carr, Doubleday 1984; ebook exclusive. Sand · Hugh Howey · ex CreateSpace 2014; ebook exclusive. The Autopsy · Michael Shea · nv The Magazine of Fantasy and Science Fiction Dec 1980; ebook exclusive. Michael Shea: No Form Is Eternal · Laird Barron · ar [Michael Shea]; ebook exclusive. Afterparty · Daryl Gregory · ex Tor 2014; ebook exclusive. Steles of the Sky · Elizabeth Bear · ex Tor 2014; ebook exclusive. Shiva in Shadow · Nancy Kress · na Between Worlds, ed. 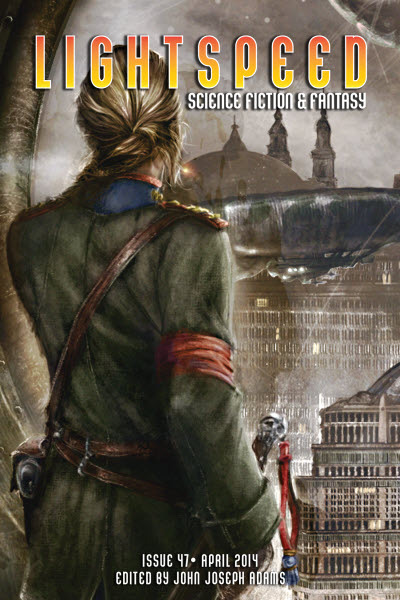 Robert Silverberg, SFBC 2004; ebook exclusive. Defenders · Will McIntosh · ex Orbit 2014; ebook exclusive. 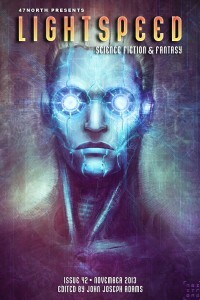 ; expanded from the short story of the same name (Lightspeed, August 2011). The Silk Map [Persimmon Gaunt; Imago Bone] · Chris Willrich · ex Pyr 2014; ebook exclusive. Babel-17 · Samuel R. Delany · ex Ace 1966; ebook exclusive. The Myth of Everyman · Sofia Samatar · ar; ebook exclusive. 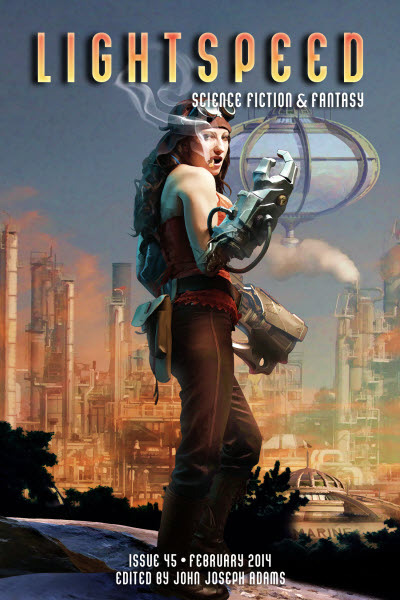 Special super-sized Women Destroy Science Fiction! issue funded by a Kickstarter campaign. 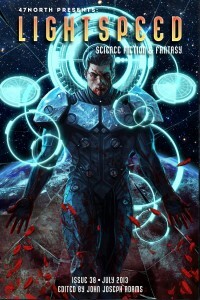 The contents listed are for the trade paperback edition - only a subset of the contents appeared as the regular online issue. A special limited edition of the book version was published for Kickstarter supporters and included an additional story. Details taken from Table of Contents and magazine website. 76 · In the Image of Man · Gabriella Stalker · ss; not in online edition. 92 · The Unfathomable Sisterhood of Ick · Charlie Jane Anders · ss; not in online edition. 107 · Dim Sun · Maria Dahvana Headley · ss; not in online edition. 119 · The Lonely Sea in the Sky · Amal El-Mohtar · ss; not in online edition. 130 · A Burglary, Addressed by a Young Lady · Elizabeth Porter Birdsall · ss; not in online edition. 139 · Canth · K. C. Norton · ss; not in online edition. 162 · The Great Loneliness · Maria Romasco Moore · ss Unstuck #2 2012; not in online edition. 190 · Knapsack Poems [Goxhat] · Eleanor Arnason · ss Asimovs Science Fiction May 2002; not in online edition. 206 · The Cost to Be Wise · Maureen F. McHugh · na Starlight 1, ed. Patrick Nielsen Hayden, Tor 1996; not in online edition. 276 · Emoticon · Anaid Perez · vi; not in online edition. 277 · The Mouths · Ellen Denham · vi; not in online edition. 280 · M1A · Kim Winternheimer · vi; not in online edition. 283 · Standard Deviant · Holly Schofield · vi; not in online edition. 287 · Getting on in Years · Cathy Humble · vi; not in online edition. 292 · Ro-Sham-Bot · Effie Seiberg · vi; not in online edition. 294 · Everything That Has Already Been Said · Samantha Murray · vi; not in online edition. 297 · The Lies We Tell Our Children · Katherine Crighton · vi; not in online edition. 300 · Artemis Awakening · Jane Lindskold · ex Tor 2014; not in online edition. 325 · Author Spotlight: Gabriella Stalker · Lee Hallison · iv; not in online edition. 327 · Author Spotlight: Charlie Jane Anders · Sandra Odell · iv; not in online edition. 333 · Author Spotlight: Amal El-Mohtar · Jude Griffin · iv; not in online edition. 336 · Author Spotlight: Elizabeth Porter Birdsall · Laurel Amberdine · iv; not in online edition. 339 · Author Spotlight: K.C. Norton · Laurel Amberdine · iv; not in online edition. 343 · Author Spotlight: Maria Romasco Moore · Jude Griffin · iv; not in online edition. 345 · Author Spotlight: Eleanor Arnason · Jude Griffin · iv; not in online edition. 347 · Author Spotlight: Maureen McHugh [Maureen F. McHugh] · Jude Griffin · iv; not in online edition. 377 · Feature Interview: Kelly Sue DeConnick · Jennifer Willis · iv; not in online edition. 386 · The Status Quo Cannot Hold: A Few Words from Women Who Wrote/Are Writing the Goddamn Book on Destroying Science Fiction · Tracie Welser · ar; not in online edition. 391 · How to Engineer a Self-Rescuing Princess · Stina Leicht · ar; not in online edition. 395 · Screaming Together: Making Womens Voices Heard · Nisi Shawl · ar; not in online edition. 401 · We Are the Fifty Percent · Rachel Swirsky · ar; not in online edition. 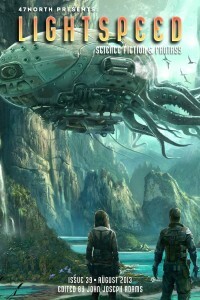 403 · Science Fiction: Youre Doin It Wrong · Maya Kaathryn Bohnhoff · ar; not in online edition. 405 · Join Us in the Future · Marissa Lingen · ar; not in online edition. 407 · Are We There Yet? · Sheila Finch · ar; not in online edition. 409 · Not a Spaceship, Robot, or Zombie in Sight · Anne Charnock · ar; not in online edition. 411 · Writing Among the Beginning of Women · Amy Sterling Casil · ar; not in online edition. 413 · Toward a Better Future · Nancy Jane Moore · ar; not in online edition. 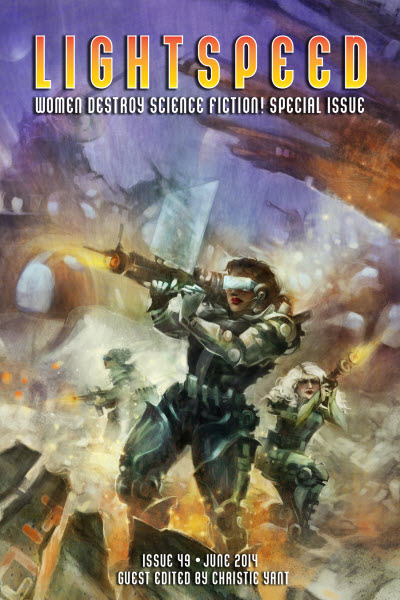 415 · We Are the Army of Women Destroying SF · Sandra Wickham · ar; not in online edition. 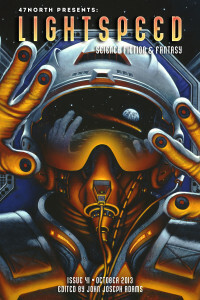 417 · Read SF and Youve Got a Posse · Gail Marsella · ar; not in online edition. 419 · Stomp All Over That · O. J. Cade · ar; not in online edition. 421 · For the Trailblazers · Kristi Charish · ar; not in online edition. 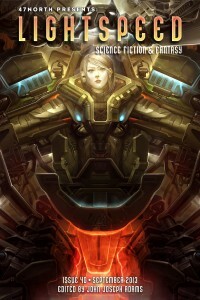 423 · Women Are the Future of Science Fiction · Juliette Wade · ar; not in online edition. 425 · We Have Always Fought: Challenging the Women, Cattle and Slaves Narrative · Kameron Hurley · ar A Dribble of Ink May 20 2013; not in online edition. 433 · Writing Stories, Wrinkling Time · Kat Howard · ar; not in online edition. 435 · Where Are My SF Books? · DeAnna Knippling · ar; not in online edition. 437 · Reading the Library Alphabetically · Liz Argall · ar; not in online edition. 440 · Stepping Through a Portal · Bonnie Jo Stufflebeam · ar; not in online edition. 442 · The Wendybird · Stina Leicht · ar; not in online edition. 444 · I Wanted to Be the First Woman on the Moon · Sylvia Spruck Wrigley · ar; not in online edition. 446 · Never Think of Yourself as Less · Helena Bell · ar; not in online edition. 448 · An ABC of Kickass, or A Partial Exorcism of My TBR/TBRA* Pile · Jude Griffin · ar; not in online edition. 451 · Stocking Stuffers · Anaea Lay · ar; not in online edition. 453 · Breaching the Gap · Brooke Bolander · ar; not in online edition. 455 · Women Who Are More Than Strong · Georgina Kamsika · ar; not in online edition. 456 · A Science-Fictional Woman · Cheryl Morgan · ar; not in online edition. 458 · Your Future Is Out of Date · Pat Murphy · ar; not in online edition. 461 · Stray Outside the Lines · E. Catherine Tobler · ar; not in online edition. 463 · My Love Can Destroy · Seanan McGuire · ar; not in online edition.